And I have a few! 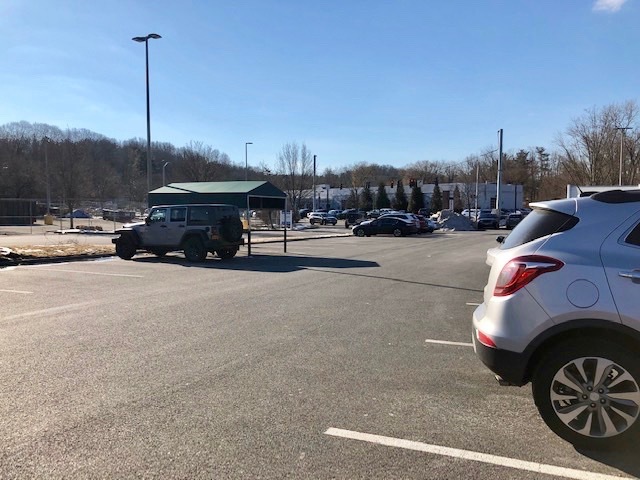 But let’s start here, in the parking lot, where people leave there carts practically on your car instead of walking the few feet to the corral. Please note how empty the shopping cart corral is. Please note how empty the shopping cart corral is. You won’t generally see that in the UK - as most supermarket trolleys need a pound coin to release them, which you get back, of course, when you return it. Pet peeve - moving the aisle where they keep, say, the coffee. I briefly worked in the industry so know it’s a deliberate policy to occasionally move the regularly bought items so you travel aisles you wouldnt usually travel. Organizing products by target audience instead of by product - eg, if you want to compare tomato sauces, you’ll need to look in the canned food section, and in the “healthy/organic/natural” section, and in multiple areas of the “ethnic” section. I used to be annoyed by checkers putting a single item in its own bag, but this doesn’t happen anymore after the bag crackdown in Seattle. So hooray for rules and regulations. Agree with nbirnel’s 1st paragraph. We have a large supermarket here that does that too. I would of course prefer ALL the items together & you can decide whether to buy organic or regular. And forget about finding bacon, it’s there but you really have to hunt for it. It’s also not with the breakfast or other sausages & they’re hard to locate as well. My other big pet peeve are shoppers in the store at peak hours that are reading. .Every. Single. Ingredient. In items they’re buying. That’s all for now, but I have more. Plenty of check stands not enough checkers. moving the aisle where they keep, say, the coffee. My local Giant does this constantly. And to add insult to injury, they make the moves in the middle of the day, clogging the aisles and making some products disappear for a time (they are open 24/7). Blocking the whole aisle. There are many ways it happens but the one that gets me the most is having your cart on one side of the aisle and then standing in the open “lane” to shop the shelf. I’ve been experiencing the the most inept cashiers lately. I’ve become reconciled to the fact that many of them have no knowledge of produce what so ever. Now they don’t understand how their scale works or the difference between a 3 lb. bag vs a single item. Recently I purchased a single white onion. Cashier weighed and rang it at .65 lb. and as a more expensive Vidalia. I pointed this out. Cashier re rang as a 3 lb bag of white onions. I pointed this out. She pointed out that it was now white onions. I agreed but explained that it was a single onion not a 3 lb. bag. She re rings. Now it is a white onion that weighs .95 lb. I question this and mention that the item she is holding in her other hand is resting on the scale. She, bristling, informs me that the scale is the red light (which reads the scan codes) not the stainless platform surrounding the scan window. At this point I gave up since there were now others waiting. I figure the price increase is a reasonable price for a ticket away from the idiot circus called Food Lion. Same grocery chain last week: I purchase 2 russet potatoes. Cashier rings as two microwave potatoes (russets which are individually wrapped in plastic for the microwave at $1.00/each. I point this out. He looks confused. I suggest he consult the plu look-up. Now he rings a 5 lb. bag of russets. I point this out. He voids that out. He is confused. He calls another cashier. They converse. I apologize to the woman behind me, she and the next patron shake their heads and say it is always like this…Cashier continues staring at the screen. I helpfully tell him the per/lb. price of my potatoes. He proudly tells me the 5 lb. bag DID void! He rings the rest of the order, I pay and leave. He never did charge me for the potatoes. It used to be I’d go back in to customer service and pay for them. After the blank looks from store managers and the idiot responses I’ve received from corporate emails I’m left to assume they have no idea why improper ringing is a problem. Unfortunately the 3 closest grocery stores to my home are this chain. The next tier in distance is Costco, TJ’s, Aldi and Lidl. Unfortunately they don’t cover all my grocery needs so I still have to go to a regular grocery on occasion. Drives me insane…I think this is part of the reason people are turning to Amazon, etc. Which decreases profits for the brick and mortars, which further erodes their service, which becomes a downward spiral until we are left with very few choices. I just returned from a grocery run. I knew it would be tough on a relatively nice Saturday with Sunday evening snow in the forecast, but the amount of aisle blocking was unusually high mostly caused by shoppers going in both directions. I wonder if any market has ever experimented with one-way aisles? And it doesn’t help when they put all of those special displays in the aisle. And don’t you just love the shopper standing in front of the meats on the phone asking what the person on the other end feels like having for dinner. Burgers? 90% lean? 85%? 80%? Pre-formed? What kind of buns? etc. Try to get a rotisserie chicken at 5:45! If they have any left they are the ones everyone rejected! I wonder if any market has ever experimented with one-way aisles? Stew Leonard does this, or used to (I haven’t been to one in over 20 years). There was grocery store in Atlanta that did this too. I don’t think it really helped with this problem. The oblivious remain oblivious regardless of the surroundings. Almost everything (I despise shopping). Keep moving things around, rearranging sections. Costs me time to look for things. Music. They don’t just play music, they turn it into a bloody concert! The oblivious remain oblivious regardless of the surroundings. Aisle blocking is one of my pet peeves. Another is kids running inside the store or more accurately parents who let their kids run inside the store.
. Another is kids running inside the store or more accurately parents who let their kids run inside the store. One time there were kids throwing around the beach balls that were in a bin while the parents smiled. Speaking of aisle blocking and kids, the carts with the cars on the front that the parents block the aisles with. Goodness, I don’t even drive (I walk to my grocery store) and I find the random carts in the lot annoying. Just so rude and/or lazy. As much as I want to be environmentally friendly, this trend towards wafer thin plastic bags is awful, especially for someone who has to walk home with groceries! Either just give us paper bags with handles, or commit to giving me a bag that won’t rip. I do bring my shopping bag on most occasions, but sometimes it’s not a planned visit and I’m stuck with a bag that I have to cradle home because of a gaping hole in the bag. A pet peeve at my preferred store happened again today: employees who can’t tell the difference between Italian parsley and cilantro. At first glance, it always looks like there is no parsley because the bin is filled with cilantro. If you dig about 2-3 layers down, you might find parsley. Dudes, the names are right on those ties you use!! People who take two steps into the store and stop to sanitize the cart, talk on the phone, check their list etc. 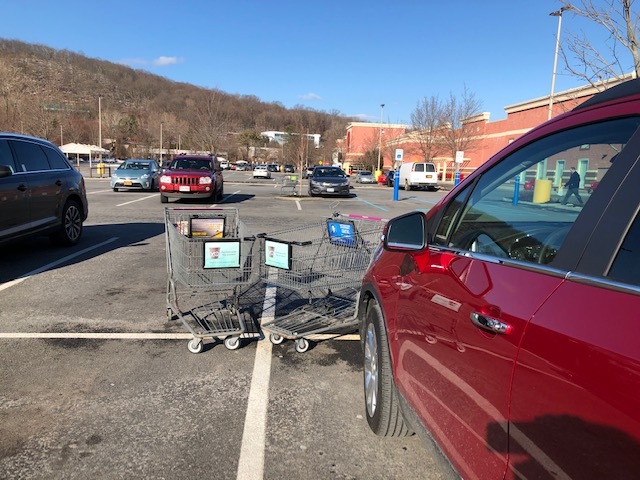 the carts with the cars on the front that the parents block the aisles with.